John Ford Clymer (January 29, 1907 - November 2, 1989) was an American painter and illustrator known for his work that captured nature and the American West. Born in Ellensburg, Washington, Clymer first studied art through the Federal School correspondence course. He continued his study in Canada, where he spent eight years illustrating for Canadian magazines. 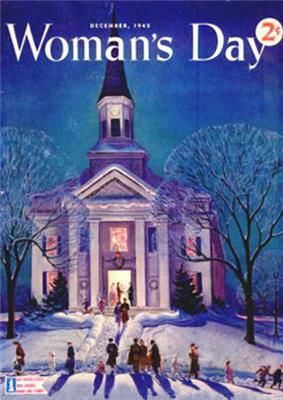 In 1932, he married his childhood sweetheart, and five years later, in the fall of 1937, John and Doris Clymer moved to Westport, Connecticut, where he established his career as an illustrator for American magazines, including Argosy, The Saturday Evening Post, Woman's Day and Field and Stream. While in the Marine Corps, he illustrated for Leatherneck Magazine and the Marine Corps Gazette. His work in advertising included paintings for White Horse Scotch Whisky, the Pennsylvania Railroad and the Chrysler Corporation. Just before the War II had done my first Post cover, an Alaska inland passage subject with a totem pole in the foreground, U.S. Navy destroyers and aircraft in the background. On a visit back home, out at Ellensburg, I noticed my young son, David, peering into a hole in an old poplar stump, looking for flickers nests. It immediately struck me as a good possibility for a Post cover. So I painted it, sent it in to them, and they bought it, saying they'd like to see a sketch for another idea. So I began to do a long series of Post covers -- approximately 80 of them over the next dozen years. My approach was to look for human interest subjects and then try to place them in a proper setting to fit the idea. Sometimes it would take a long time to bring the two elements together. One early idea involved a young boy playing in an abandoned auto chassis, but I couldn't figure out how to present it. Two years later, while driving through Jackson Hole in Wyoming, I noticed some old, rusty farm machinery in the corner of a field. It then struck me that this was a perfect spot for the old car. A Western boy would be brought up on horseback riding, but when he spotted the old auto body, he ceased to be a cowboy and was transformed into a hot rod driver. There was only one drawback about doing covers for the Post. They went everywhere in the country, and because I picked and painted actual places, there would be several hundred people who lived nearby who'd scrutinize every detail to try to find something wrong. I had to be sure I knew all about everything included in a picture, and why it was there. There would always be someone like a telephone lineman who'd write in and say, "I don't think that was the kind of insulator they used in that area." The Post was good about those things. The only time I had to make a correction on a cover was when I sent in a picture that had an automobile in the foreground. I had completed everything, lights, chrome, trim, spokes, but forgot to paint in the door handle. In 1976, Clymer received the Prix de West from the Academy of Western Art. His oils and charcoal drawings brought him medals from the Cowboy Artists of America. He was named Western Artist of the Year by the National Wildlife Art Collectors Society. In 1988 he was awarded the Rungius Medal from the National Museum of Wildlife Art (Jackson Hole, Wyoming) for his painting Late Arrivals, Green River Rendezvous. He was made a member of the Royal Canadian Academy of Arts. Clymer died in Wyoming. Today, his work is on permanent exhibit at the Clymer Museum of Art. located at 416 North Pearl Street in Ellensburg, Washington. He is sometimes confused with John Clymer, an impressionist painter of landscapes and nautical scenes. ^ , Northland, 1976,John Clymer, an Artist's Rendezvous with the Frontier WestReed, Walt.